So how do you avoid encountering this issue? You create your wedding budget based on percentages of your total budget. The following are my recommendations for the percentages you should be allotting for the major areas of your budget. **Includes all other vendors that are not listed above! Note: The above areas are by no means ALL of what is needed for a wedding or what is required, but they are a good general starting point and rule of thumb. 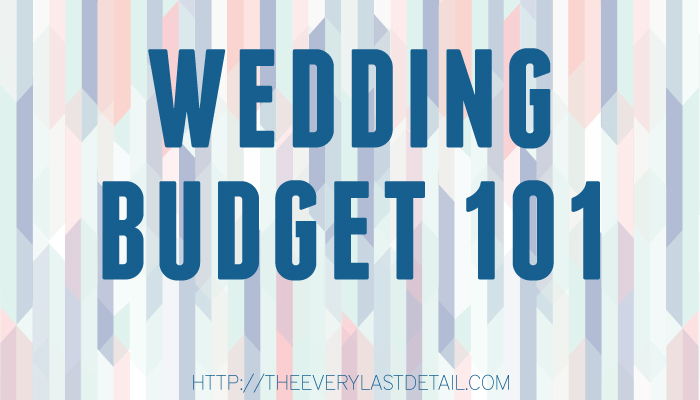 Please also refer to other budget recommendations to determine the perfect budget formula for you and your wedding. I have created an Excel spreadsheet that contains formulas that work with these percentages. Click above to access the spreadsheet! Once you have these percentages figured out for your budget, you can then adjust everything according to what matters more to you and add in other things that you need. Do you want a wedding that has fabulous design and decor with some awesome photography, but don’t really care much about the venue? Spend less on your venue and food, and transfer over more “percentage” for the things you really want. Give a little and take a little. 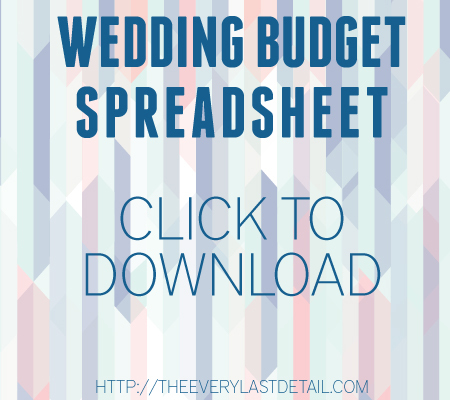 Want more info on wedding budgets? great advice. as a wedding vendor it always helps when we know what a bride is comfortable spending. though we can’t just rattle off a price for flowers as prices change and there are so many options. we generally give a range and ask for as many details as possible from a bride first. we are disappointed when we go from a $10,000 job to a $2,000 job too. So much to learn about what all I should expect for my wedding. Sometimes overwhelming, but I’m glad there are sites like this one that help me to better understand what the norms are. Hate to admit it, but cannot wait till all is said and done! Having a budget for your wedding makes things a lot easier for the bride and groom and the vendors. When our clients come to use with a clear budget of what they want to spend on their wedding limo, it makes it much easier for us to provide them with realistic options for their big day. Thank you for the spreadsheet, having got engaged last July I am finally beginning to plan the day, after being overwhelmed with how much there is involved with planning a wedding! My budget is very small, at about $13,000 but we would like to have an intimate affair with no more than 15 people, so I hope it is possible. Just one thing to note- It would be great to have a section for attire on the spresdsheet, as that is a necessity for all brides I would imagine! Out of interest, what percentage would you suggest for bride & groom’s attire? I always find the thing that I do the must with brides is educate them. Most have never been married before so they really don’t know who’s who, what’s what and where to even start with planning their budget. The first thing we do is talk through their expectations and dreams and then I set it all in a realistic budget. Sometimes it has a big sticker shock effect, sometimes it’s just a relief to see it all down on paper and to really know how it all works. I’d also like to see information about how to source quality suppliers. They are the ones who charge a fair rate, give great service and will not run away with a deposit and never be seen again. It’s worth noting, that a fair rate is usually not the cheapest and for the brides. Your allotment for the entertainment is FAR too low. Entertainment is more important than photography, florals/decor, and a planner. If your vendors (DJ, venue, caterer, & photographer) are experienced and qualified then they should be able to coordinate (usually through the DJ) a wedding night. So why is the entertainment/DJ more important? According to brides and guests entertainment is the most memorable part of a wedding. 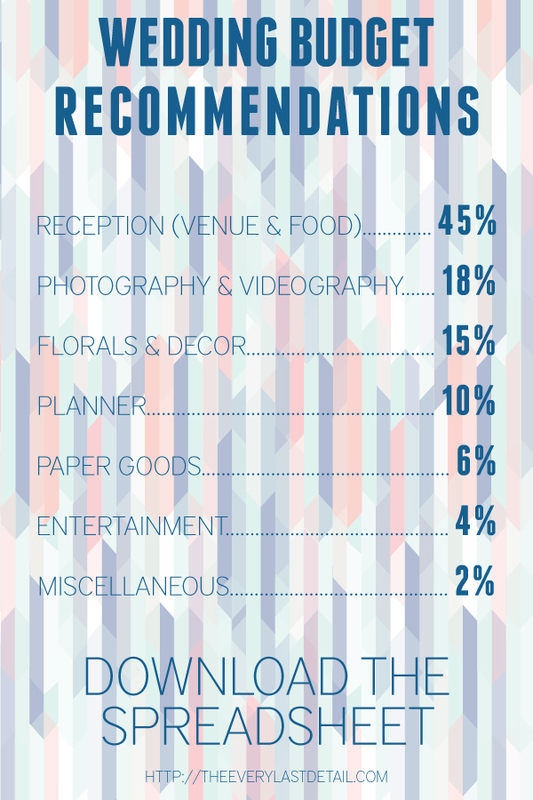 In fact, most brides wish they had spent more on their entertainment. This was all published in St. Louis Bride & Groom. If the people aren’t smiling and having a good time then that’s what the photographer is going to capture. If the DJ is doing their job, and people are having a good time that is what the photographer will capture. Decorations are remembered as pretty or not noticed… Unless something is really ugly. But honestly, guests don’t remember the exact flowers or chair covers at the wedding. Now, does it help with pictures? Sure, but people will still remember more about how they felt vs how the decorations looked. I’m in no way suggesting that any of these categories I’m saying you have too high aren’t important. They are just not as important as the entertainment. Also, just like being a good photographer is not an easily acquired skill, the same goes for DJs too. I say this as both a professionally educated musician/DJ and photographer. What about the Wedding Dress? @Breanna, I consider the wedding dress as a separate expense from the full wedding budget because there is such a wide range of potential prices depending on the designer, dress, and of course the bride’s preference. Pingback: Emlily Floral | Useful Information For Your Wedding Flowers!